In honor of the mini snow day we have received in Atlanta, I thought we could chat about Winter White Fashion! I know what you’re thinking, “Wait, you can wear white in the winter?” Yes, my darling southern belles you absolutely can wear white during the winter! As a matter of fact, you can wear white any time of the year if your little heart desires! I realize it goes against everything your momma taught you, but trust me you are going to enjoy wearing all white! I absolutely love white….white everything! White is easy, clean and refreshing. It also makes a big statement without all of the fuss. You can grab the white pieces in your closet and start putting together the best ensembles! Do not be afraid to grab shades of cream, grey and light pastels! One thing to keep in mind when tackling the winter-white-out trend is that it’s All About the Fabric! Lighter textiles such as thin cottons, seersucker and linen will look out of place during the winter months. Reach for chunky sweaters, white wool, cashmere, flannel and leather! If you still want to spice things up a bit, adding colorful accessories such as shoes, handbags and statement jewelry pieces is the way to do it! Fun accessories are also an easy way to dress up an ensemble! For you bold babes out there, a red tinted lip color is perfectly appropriate. This trend is perfect for those moments when you do not want to think about matching your clothes or for those of you who are simply minimalists! Either way, this trend is effortless, chic and Properly Stylish! Life In Black and White…. 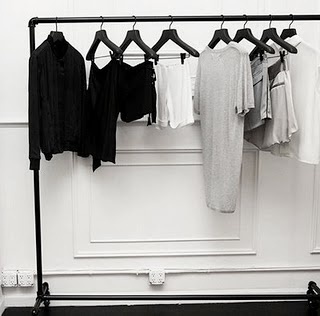 It’s true…..the leaders in fashion design have given us permission to fill our closets with Black and White! If you’re are anything like me, you never really needed permission. 🙂 My closet is filled with everything from black and white dresses to blouses! 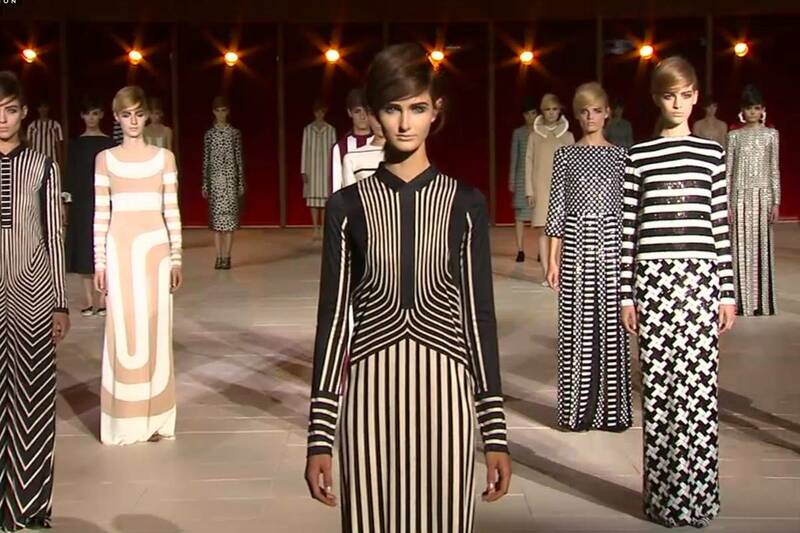 The runways have been filled with head-to-toe black and white designs. I hold a sweet spot in my heart for Black and White fashion ensembles. The pairing is classic, timeless and simple to put together. From Alexander Wang to Michael Kors, these high contrast looks of black and white are anything but boring! This season’s trend gives you freedom to pair bold black and white prints. ….If prints tend to overwhelm you, not to worry, keeping the trend simplistic with clean lines is the way to go! It would be a magically fashionable world if we all rolled out of bed looking like we were plucked right off of Dior’s runway! The reality is we have families to care for, corporate ladders to climb, and a household budget we all wished was much larger! Let’s go over some ways you can rock this trend and look properly stylish! Style Tip 1: Keep it simple! The easiest and most economical way to wear this trend is to use black and white staples you already own! Everyone should have options to choose from, so shop in your closet before heading to your favorite stores! Pair items like a white tee with a black pencil skirt or skinny pants and accessorize with statement jewelry and a pair of pumps. Feeling a little bold this season? Go wild pairing several black and white printed pieces in one look. …..Or you can select one printed piece for a more subtle approach. For instance, a printed pant with a black or white blouse. If your a minimalist when it comes to style, then you are going to love all of the color blocked options! Pretty simple, right? 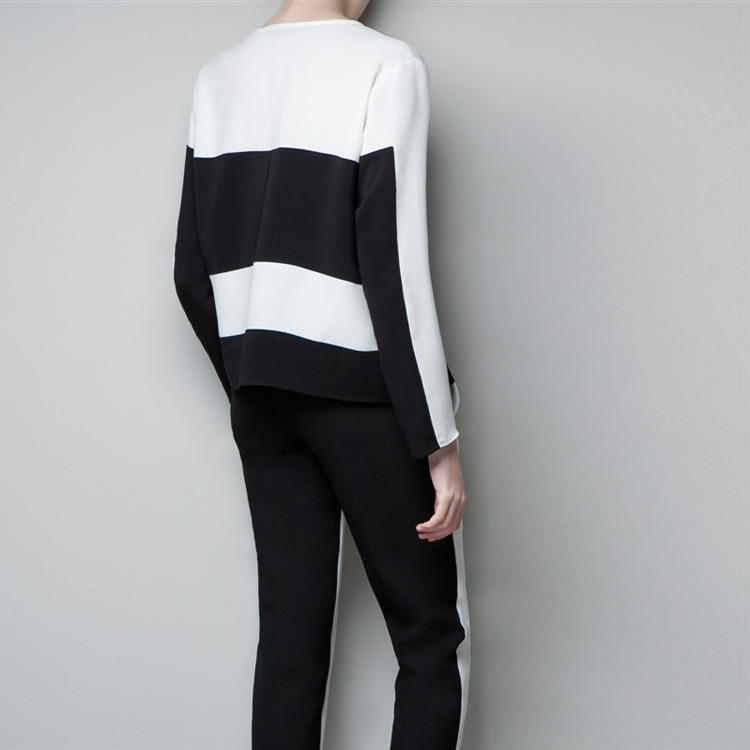 Will you be wearing black and white this spring? 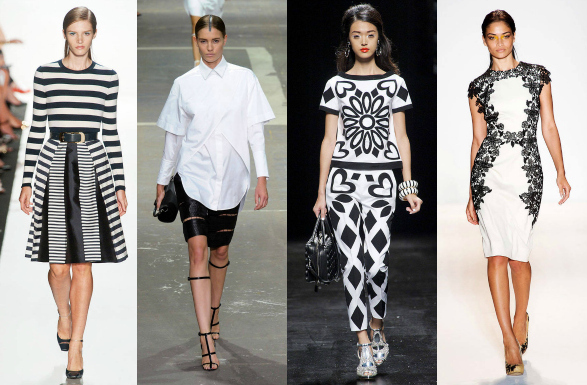 I would love to hear your thoughts on this Spring 2013 Black and White Trend! Neon Trend….Can you pull it off? This summer it’s all about brights and neons. One of the HOTTEST fashion trends is the Neon Trend! When I first noticed neons were making a come back, I immediately flashed back to the big hair, crazy makeup, Cindy Lauper (love her) and 1980’s neon fashions I would like to stay far away from! Wondering if you can rock this trend? I say, ABSOLUTELY! The neon trend is fun way to give your style a boost! You can keep it simple, but still make a big statement! Simply pair tailored shorts with a classic button up, add a great accessory and you have yourself an on trend, neon look you can be very proud to wear! If you are feeling daring add a bold print! Choose one bold print as the point of focus and add in a coordinating color. You can keep the jewelry simple when using bold prints and colors. There are so many ways to wear the neon trend. Find what’s right for you! This look is for all of my ladies who are scared to try this hot trend! You to can wear this look well! Try pairing neutrals with a pop of neon. I love a clean simple ensemble! 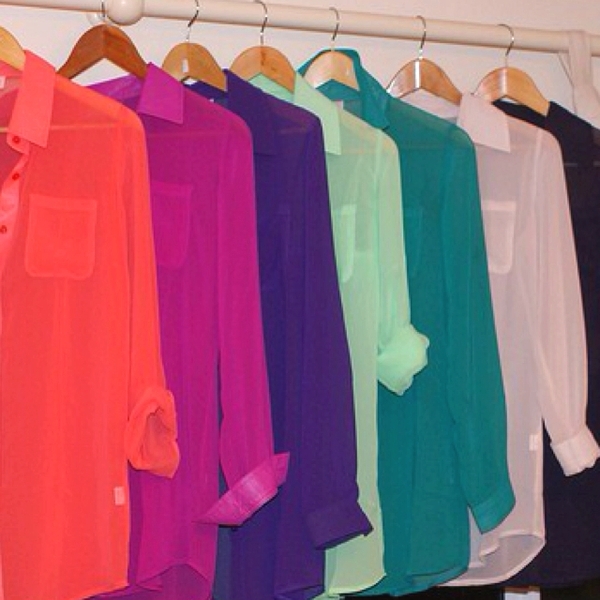 Rock your neon blouse with something neutral on bottom! For the office, stick to slacks (wide leg or skinny shapes are the best for the season) or a basic pencil skirt. You want to juxtapose this super trendy piece with something more basic, so look to your go-to office garb for pairing. Neons and charcoal or chocolate are great for the winter, but when it warms up, go for neutrals like creams, khaki or camel. Neon accessories work for any occasion. If you work in an conservative office, a neon accessory may be the only way to implement the trend at work. A skinny belt is a safe bet, as is a silk scarf. Tie the scarf loosely at the center of the neck and let it hang down the front of a tank or blouse under a suit jacket. A skinny neon belt can wrap the waist of a pencil skirt with belt loops and adds fashion forward appeal to a button-up white shirt and camel skirt. Don’t forget easy jewelry, like a big cuff. If you can’t wear trendy pieces to work, remember that a bracelet or earring in the color of the moment makes your look fun without distracting attention. Are you feeling bold and inspired? I hope so! Now get out there and make a bold statement with your PROPER STYLE!